Kolkata Medical Treatment is being defamed very intelligently by the Private Hospitals and other states are making huge money. This article depicts the picture of the same. All these Private hospitals plays the game of defaming Kolkata’s medical facilities. All these private hospitals are creating fear of medical treatment in KOLKATA and shifting patients directly or indirectly to other states for treatment. This have been tricky game being played over the last 15 or 20 years and just calculate the loss to the West Bengal government. Don’t believe me. Think what I have written and then find the real reason for defaming Kolkata’s Medical Industry. You will get a clear idea why, how they are playing this game over so many years in the last 15 to 20 years. They are simply making Kolkata poor and defamed.Its strategy of State Business Development. Apollo is one of the key gainer of this type of Business strategy. Since Apollo is the only name which comes in mind when we think of treatments outside of Kolkata. MEDICAL negligence have become very strong and now its high time people should know that Consumer court is their where no fees are required for filing case.They are playing the game deliberately. Also their threat of Living the City and taking Apollo out of Kolkata is going to be big loss for the Hospital Giant and hence they will never do it in their life. They have created great advertisements to attract patients. They have taken advantage of the deliberate collapse of Public health facility and indirectly created fear of poor health facility at Kolkata. These hospitals often say even in the last discussion Apollo Hospital CEO-Rana Das Gupta said that they use high cost of advanced medical equipments to do treatment and hence the cost escalates for the treatments. Hospital gets huge benefits under taxation schemes and also for having huge hospital capacity. These hospitals enjoy stupendous taxation benefits spread over s long term which reduces the impact on its books of profits earned by the hospital. They don’t write off the entire cost of the highly priced medical equipment at the 1st year. They split the price and take various income tax exemptions across all segments. Now Kolkata is being defamed that Medical Treatment is of very low category and hence best is to get into different states for Medical Treatments. This has been one of the most common statements being heard and implemented in Kolkata for any treatment. They leave the city of Kolkata and get into states Like Chennai, Kerela, Hyderabad, and Bangalore and mostly in the southern state of India. · Public and Private Transport- One of the strongest revenue source for the people who come in other states for travelling. On an overall basis its can be easily identified that Kolkata is being defamed deliberately and other states are making money at the cost of defamation. Sothern part of India have gained huge name in terms of medical segment due to the tricky game played by these Chennai based or South Based Hospitals in other states. Apollo is the only name which comes in mind when we think of treatments outside of Kolkata. Now the process of defamation is very easy. This negative marketing of Apollo and Kolkata’s other Private Hospitals will make huge money now and also other states since this defamation will lead to flight of patients to other states for treatment. CPIM have played the game very interestingly. They invited private hospitals and later on shifted the patients by creating fear to other States. 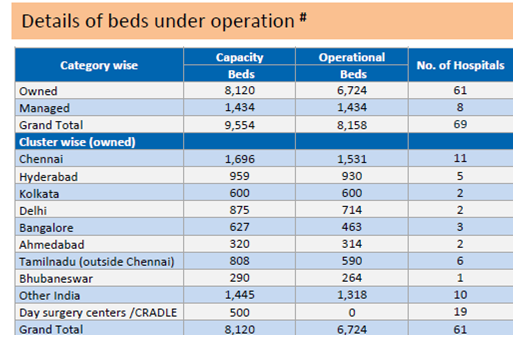 The side data of Apollo hospital according to its investor Presentation March 2016 its shows that they have increased their beds in Hyderabad and Chennai and not much in Kolkata. Reason is simple Apollo is defaming Kolkata and making other states rich. This a huge revenue loss to the state of West Bengal. 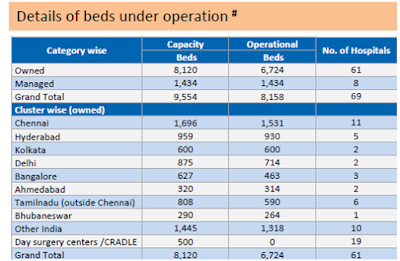 The data shows Hyderabad and Chennai are the prime zone. Its good to be smart but not think others to be fool. Even Some Lawyers can file PIL taking several clients together to get justice. We should not bog down to these devils of the medical system. We spend money hence we are clients to the hospital. It’s the duty of the hospital to provide best medical services. 2ndly doctors should now be treated with hard hands with Zero tolerance of their activities. If we don’t stop these things here don’t worry next time you will be the victim either of Apollo or some other hospitals.